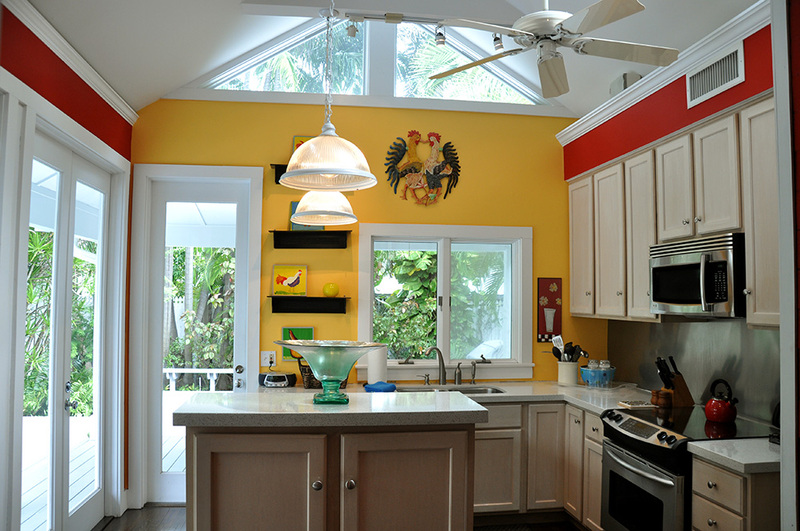 28 Day Minimum rental: Packer Retreat is a beautifully renovated "Conch" house with many architectural touches in the charming historic district. 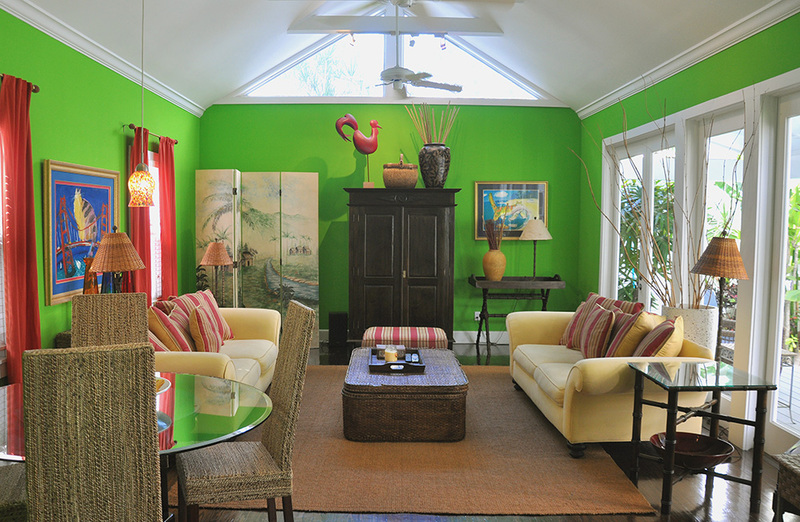 Designed to bring the outdoors in, this home features a bright living room with cathedral ceilings & tall French doors opening to the pool & garden area. Nicely decorated throughout, this two bedroom, two and a half bath main home has a open, airy kitchen that looks out to the pool and deck area. 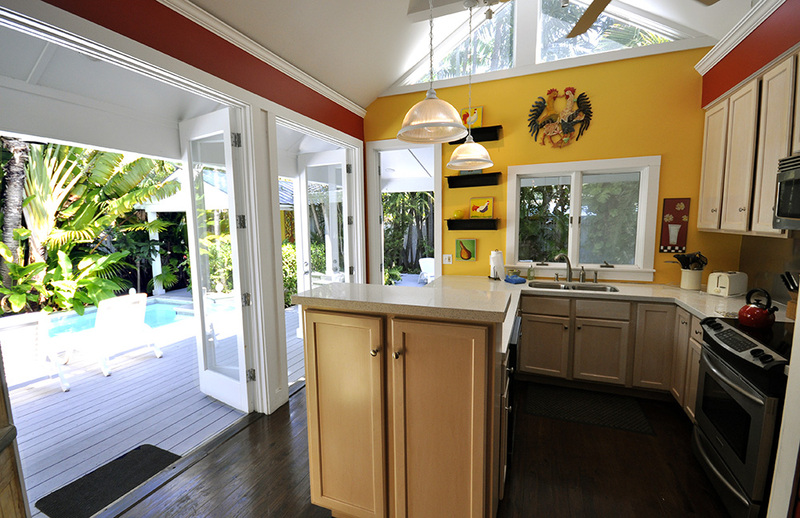 Adjoining the kitchen is a covered dining area. Also off the kitchen is a wonderful powder room with a wall of wood rescued from the original portion of the house with remnants of the paint used on the walls when the house was built. A full indoor laundry room adjoins this half bath. Float in the pool or relax in the poolside "cabana" at the opposite end of the pool from the living room. 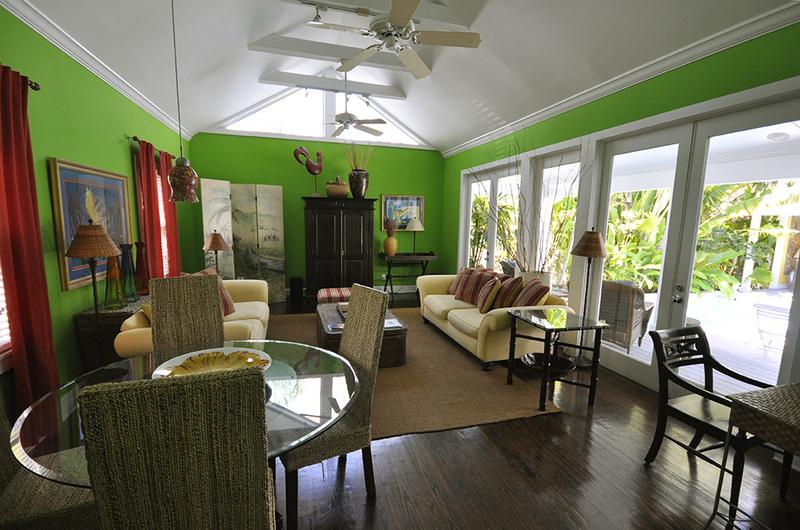 In the cabana is one additional bedroom & one bath with shower. Back in the main house, the master bedroom is in the original shotgun portion of the home. With high ceilings and white panel walls, the dark furniture is set off from the blue painted floors. The master bath features a oversized slate shower and walk-in closet. 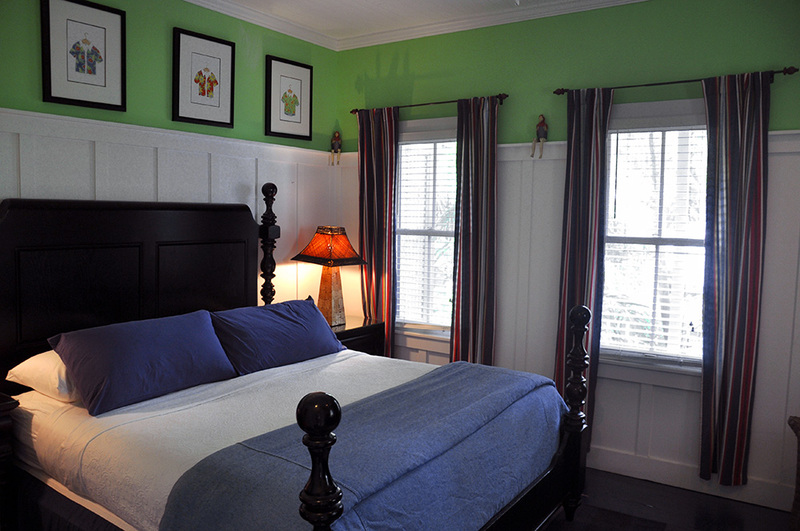 The second bedroom is next door with a queen bed and full bath with tub. There's lots of deck space to enjoy the tropical climate here. Catch some sun or relax at night under the stars. This is great home for a long vacation. We stayed at Packer Retreat for the Month of May this year and we thoroughly enjoyed it. We hope to return. This is a beautifully appointed home with large living spaces and more than adequate bedrooms. The pool was awesome, nicely shaded and we opted to use the pool heater. We spent time in the pool just about every day! 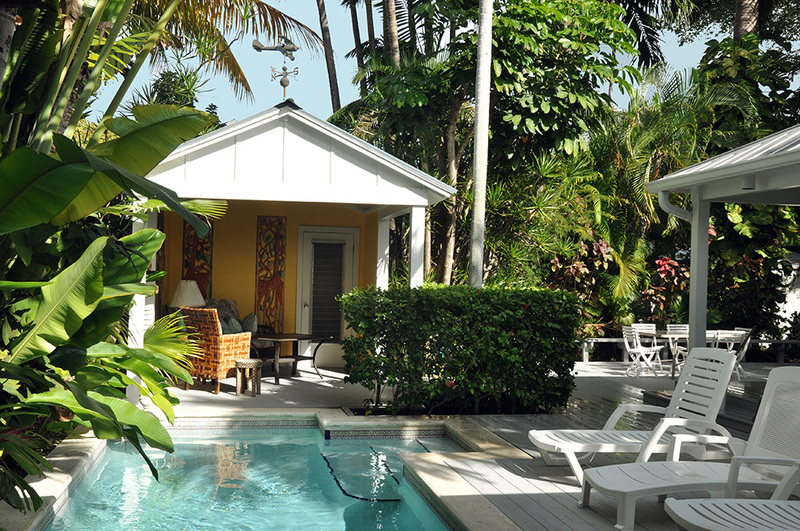 The management company RentKeyWest Vacations was very responsive to any concerns we had...we've used them in the past and will use them again I'm sure. While we would return in a heartbeat, a good idea would be to screen in the porch off the master bedroom to make it a usable space. The house is very comfortable, spacious and beautiful. Large outdoor patio. However, cleaning condition really suffered. We moved in the same day someone else moved out: light switches were stained with grease, floor was dusty and dirty, curtains never been washed. My mom has asthma, we had to hire people to clean the property next day. We bought new linens, blanket and pillows. Grill is rusty, falling apart. Limited cooking appliances. Great vacation home for family & friends. Well kept, clean with large back yard. Recommended for any age group. Rented this house and loved it. 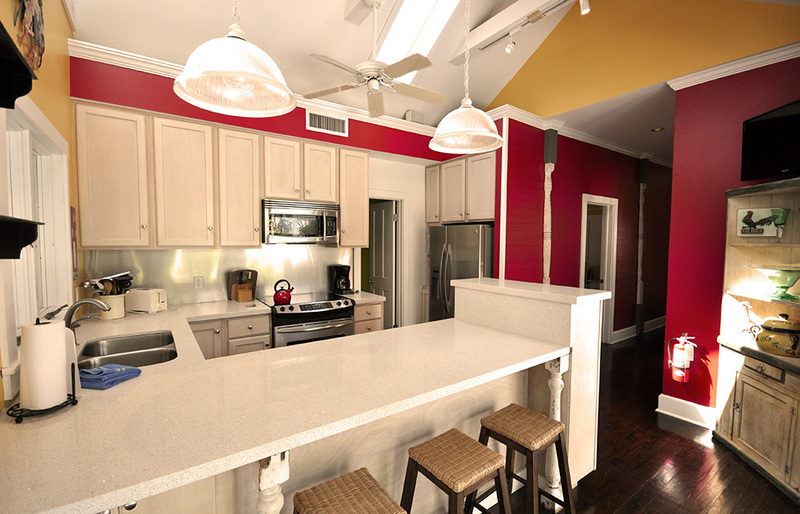 The location couldn't have been more ideal - close to the beach, dog park, and Duval Street, you could walk everywhere. The house was very clean. 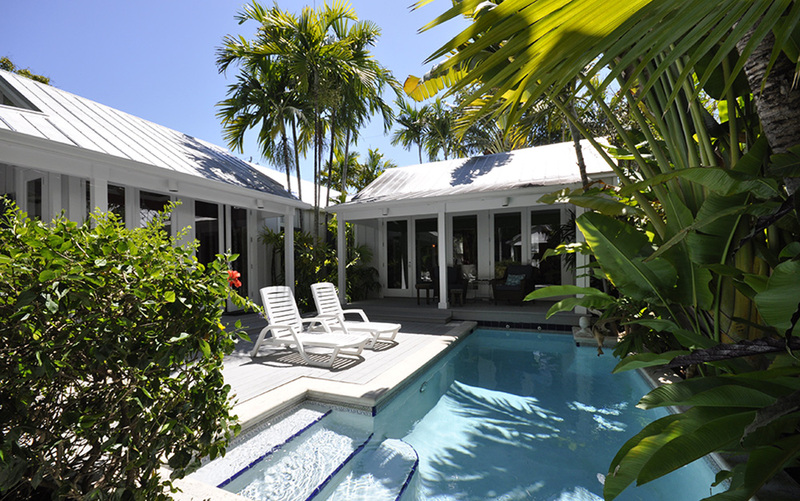 The pool was also pretty nice, and big for Key West. If had had to give a negative, it would be that the house needs a little maintenance. The plantings around the house are in need of trimming up, and the guest cabana smells musty (but it was very clean). Dealing with the rental company was also very convenient and they were very nice. I would rent it again. The house I rented in KW was perfect. With total privacy in the backyeard the property and house combined for e great relaxing time. The home had everything you would need to be "at home" barbecue grill, blenders and all the things you dont get in a hotel. This house fit our needs to the T. Close enough to everything... so bikes worked well. The house has a separate guest room beside the pool away from the main house..great for privacy of guest. The house could use some maintenance, it is my understanding that quite a bit of work was scheduled after our departure, but nothing glaring I'm just picky. We had our dog with us and the layout and privacy of pool area and outside decks was great. Overall was well pleased and will go back next year if possible.